It’s not about simply closing the gap in Aboriginal health. It’s about Indigenous peoples leading the way. “The limitations of other populations in Canada should not be the ceiling for which Aboriginal people in Canada aim, because I think that, as a population, if we work together and if we have the support of the healthcare professionals … then I think we can actually, in some ways, be leaders in health,” said Dr. Nadine Caron, winner of the 2016 Royal College Dr. Thomas Dignan Indigenous Health Award. Caron, a Sagamok Anishnawbek, is a general and endocrine surgeon who works in Prince George, B.C., and teaches as an associate professor in the University of British Columbia’s northern medical program. She is also the co-creator of UBC’s Centre for Excellence in Indigenous Health, which she has co-directed since 2014. The Dr. Thomas Dignan Indigenous Health Award was established in 2014. While Caron is thrilled to have been recognized in the spirit of Dignan, who pursued rights and justice for Canada’s Indigenous peoples, she gives more credit to the college. “It’s really a tribute to the college that they have this award, that they would recognize that this is an important area that they are responsible for,” said Caron. Caron is Canada’s first female First Nations general surgeon, a detail she wasn’t aware of until the award was presented to her. 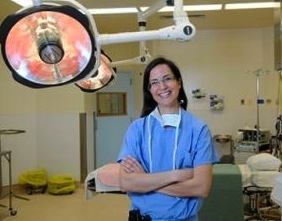 She doesn’t know if there are other Indigenous female surgeons. What she does know is that even though post-secondary schools are more aware and more active in recruiting Indigenous peoples into the healthcare profession, there still are not enough Indigenous physicians, nurses, dentists, and other healthcare providers. The healthcare system may claim to be universal and equal, but Caron contends that that is not the reality. She has heard heartbreaking stories from her patients about their experiences, or the experiences of their families or friends, in the healthcare system. Because of that, she says, it’s not a matter of Aboriginal healthcare providers matching the percentage of Aboriginal peoples in Canada. “If people’s access to reach those (healthcare) resources, and to trust those resources, is different, then you have to adjust what’s equal to make sure everyone can have the same access,” she said. What also needs to be adjusted, says Caron, is the view western medicine has of Aboriginal traditional healing practises. While surgeons easily pair cancer surgery with follow up chemotherapy or radiation, they aren’t so quick to connect surgery and follow-up patient care with an Elder or traditional healer in the community. “It’s the same thing. As a surgeon, I don’t do chemo or radiation, but I recognize there are other avenues to treat this. Working particularly with the Aboriginal patients I see, is to have these discussions early on in terms of what other areas of health care, healing and wellness will they work with to get them through this, to be open with this and to talk to them about this,” said Caron. Caron is confident that Aboriginal people can set a high standard in health, with a holistic approach that blends physical care with mental, spiritual and emotional well-being. “I think that there’s areas that we can really lead this charge … (but) we’re a long way from there. But unless we start recognizing that we need to put our aspirations in a place where we want to be and not be limited by other people’s limitations, I think we might be aiming too low. And that’s perhaps my optimism. But better to be optimistic,” she said. Caron draws strength from the work undertaken by the Truth and Reconciliation Commission on Indian residential schools and the seven (out of 94) calls to action that focus on health. She says she wields the document like a tool, something that is irrefutable in the face of non-Aboriginal denial. She says she will keep the TRC’s document in her bag as she keeps speaking out on the local, provincial, national and international levels for Indigenous health care.